We are not animal control. We cannot do anything about dogs that are being mistreated or abused. Other than notifying Animal Control... If, after the ACO and/or other officers make the call that the dogs can no longer belong there, then, again, if we have room, we will consider taking them in. We do not take in mixes. We have found, unfortunately, that people that come to Shaw PBR to adopt do not want a mixed dog. We have also found that the mixed dogs are more likely to have behavioral problems and be less stable than true pit bulls. We can not make room for 'just one more dog'. Most every call we get asks this question. If we made room for 'just one more' each time, it would never end. We have had up to 69 dogs at our location, but were not able to provide the appropriate amount of time each dog deserved. To be able to provide the best care, we must know (and stick to) our limits. We do not pull from shelters. While we have done so in the past, our focus needs to be more on the abused, abandoned, or neglected. We are a privately run rescue - no city, county or government funding. We, unfortunately, do not have the turnover rate that shelters and humane societies do, nor the option of Rescue Waggin or Homeward Bound to ship dogs up north. Our adopt-a-bulls are with us for life. We cannot fund surgery or other medical care for your dog. We do not receive government, city, or county funding. Any grants we receive are grant-specific (ie. spay/neuter, vaccinations). We hold fundraisers, events and sell merchandise to fund our own medical and other expenses. We simply do not have the funds to be able to provide for anyone else. Kennels, crates or anything other than the dog, the collar, leash and it's health records are not part of a dog's adoption. Adoption fees are $100, which already covers spay/neuter; all vaccinations, including rabies; heart worm preventive and flea treatment while in our care (this must be continued each month by the adopter); and micro chipping. We cannot let a dog leave the rescue unaltered. Unbelievably, we receive many requests for various reasons why a potential adopter would want an unaltered dog. This is not going to happen. There are too many unwanted dogs and puppies in the world today, and we will not add to that problem. There is no shortage of dogs, and there is no reasoning anyone could provide that would make us change our minds. We do not dock tails or crop ears. This should never be done; and we do not condone it. However, we do occasionally get rescues in that have cropped ears, but it is not something we have had done. We are not a drop off station for your dog because you are moving; or for a dog that you 'rescued' but can't keep. 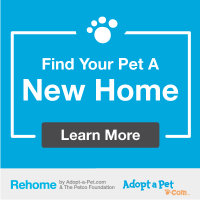 You are not doing the dog any service by handing it off to whoever will take it, just to say you found a "home" for your dog. Any dog that comes to our rescue could be here for life - every day feeding, watering, cleaning, medical care, etc. - and those bills add up, quickly. We can not cross post your dog. We have 30 of our own to find homes for, and they need to take priority. We would suggest finding several pages and groups to post your dog on, with your information, and hopefully you can find the dog a home. Guilt trips piss us off. Telling us the dog(s) are going to die if we don't take them doesn't work. It actually does the opposite. We are not the reason the dog is in the condition it is in, and you are the one that is turning your back on it. If anyone should be feeling the pain of guilt - it should be you, not us. We do not take puppies that you haven't found homes for. If you want us to take your unwanted puppies, you will be asked to turn over your adult (breeding) dogs, as well. (Assuming, of course, that we have room). We do not encourage breeding in any way, shape or form. You are their lives; you are all they care about and all they have. Stop shirking responsibility, and don’t try to rely on third parties to do all the heavy lifting for you. You thought you were good enough for that dog in the first place, now prove it. I’m sure you’re asking by this point, so what - exactly - are we here for? We’re here for the abandoned, for the abused, and for the neglected. Our job is to take dogs that have never known love – only fear, hate, and abuse. We’re also here to help the people who love, cherish, and want their animals, but life just won’t let them. For example, the elderly lady who’s being moved to assisted living, or the single man or woman who lost their job and can barely feed themselves, much less a four legged companion.